Have you ever been lost? Well I was lost most of the day! In the end, it was worth it!! Here’s how my day went. It was cold, grey and very rainy. 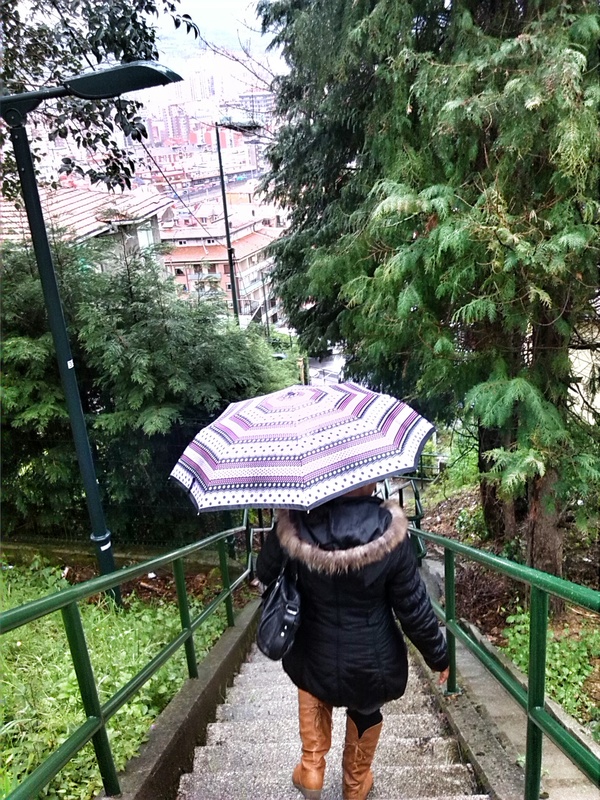 This typical Bilbao weather didn’t stop the friends, there was a nice group out this morning. I worked along with three other sisters, one who is a new publisher and today was her first day working territory. We spent the morning lost! 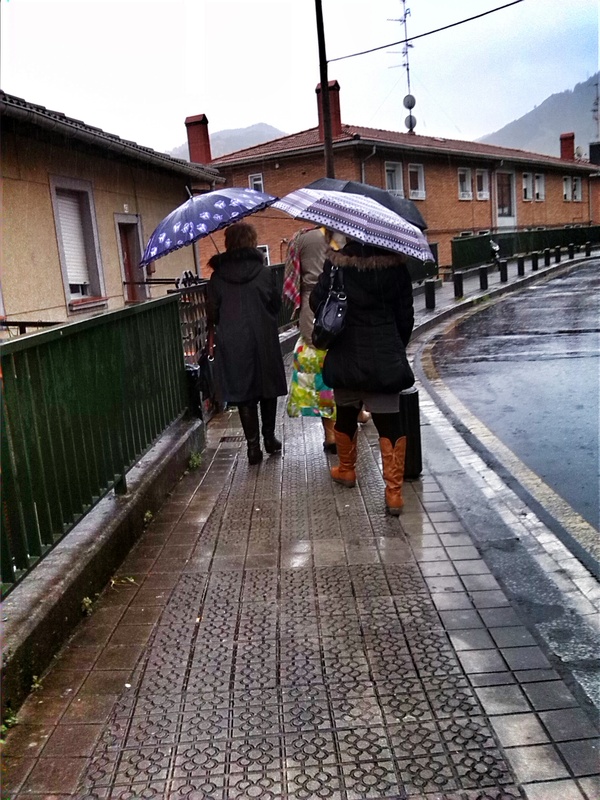 We were like missionaries, walking up mountains, in the rain, looking for addresses. We all had fun! It was especially encouraging to see the zeal of our new publisher. She was on fire! 🙂 She even interrupted a man on his phone, then she spoke to the person he was talking to on the phone! It was a nice morning. Cold and wet yet still smiling! This is service in Bilbao. Then going back for lunch, I got lost. I arrived towards the end of the lunch. After lunch, I decided to go home instead of meeting back for evening service. I had a referral that I told I would meet and since she lives on the way to my house, I decided I’d try to meet her on my way home. Before I continue let me tell you about getting directions in Spain. No one gives you their exact address. It’s like pulling teeth to get it. It’s really frustrating! So I call Tina my referral to get her address. Instead she continually asks “Where are you now?” And then when I tell her she says, “Just go straight down until you see a park with two cars and steps.” That’s clear, I think to myself 😕 This is the typical response when you try to get someone’s address. So naturally, I spent the next hour and a half lost, constantly calling her for clarification. After searching I was so tired and frustrated I called and told her maybe I should try another time. She was so upset with that suggestion that she hung up on me! Umbrellas are a must have for the ministry here! I was surprised but I knew that I had tried my best. So I went home. As I was going up the stairs to our apartment, my phone rang. It was Tina. She was walking trying to find me. So I left again thinking ‘wow, she’s determined’! I finally found her and followed her to her house. (Which btw she did not live on the street she had been telling me she lived on). She is a very humble young woman from Nigeria. She lives in a very small room with no bathroom or kitchen. She is here all alone and she opened up about her history and problems. I was able to read some scriptures and she accepted a study. She even wants to come to the meeting on Friday:) She will have her first study on Thursday. We shall see how things turn out! So I was lost all day but found an interested person so it was worth the effort!